Black Friday Sales & FREE $25 dollars! Just wanted to give you all a heads up with some exciting things coming up this week. A couple of things I can announce now... a couple you'll have to wait for! ALL BULK TOYS (mini parachute men, bouncy balls, mini farm and zoo animals, ETC) will be 40% OFF! Yes, that is a screaming deal!! ALL PLASTICWARE (great quality and over 20 colors - bowls, cups, tablecovers, cutlery, plates) will be 40% OFF!! This is also a screaming deal!! And... if you use an American Express Card - check out this link. Basically you spend $25 in our store this Saturday the 26th, and you will get a $25 credit on your American Express statement. It's true!! This is the 2nd Annual Small Business Saturday that American Express has sponsored, and it's SUCH A GREAT DEAL! If you watched us on Studio 5 today, you will know just what to do with this recipe card... If not, well then - here's the scoop! Copy & paste this recipe card into a word document. Use a text box to type your recipe over the top of your card. Print out multiple copies of your recipes, setting them in a small wooden box or crate next to the dish that the recipe goes with. Or... if you have a favorite family recipe that is always a hit, type up your recipe, slip it into a flat cellophane bag (to protect it), wrap a ribbon around it, and place in a basket at the door for guests to take when they leave. 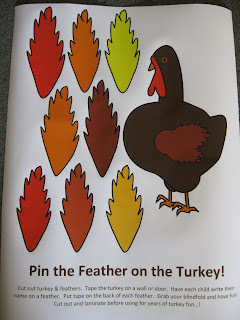 #4 Thanksgiving Feast Add-Along Game This is a game with no planning or supplies needed! Players sit in a circle. First player starts out saying, "I ate a (blank) for Thanksgiving dinner." The next player says, "I ate a (repeat what 1st player said) and a (blank) for Thanksgiving dinner." Repeat and repeat! If a player forgets or messes up the order - he or she is out. Last player in wins! But would be great to use on: A new hat A new necklace A pinata Cupcake Kits Christmas Deco & more! 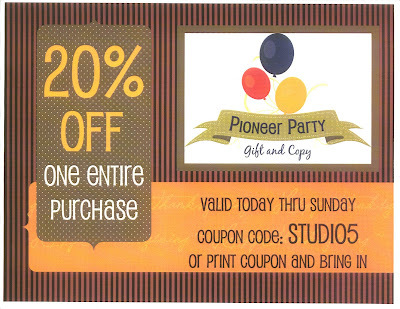 So get up early to hit the big sales, get some breakfast & a nap, Then head on over to Pioneer Party! If you have little ones, you will love this FREE DOWNLOAD! 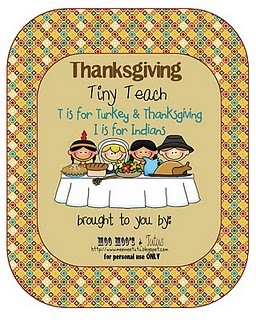 Moo Moo & Tutu's blog writer has come up with 32 pages of turkey fun activities... It's a must see! I can't wait to use it with my 4 & 2 year old. Just click on the patterns below to print them out for your patterns. 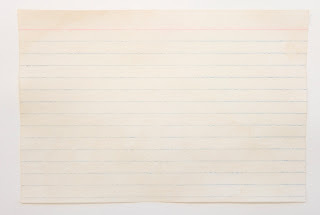 And in case you need BROWN TISSUE PAPER, we DO have it in stock! It's a hard color to find... HAPPY (early) TURKEY DAY! 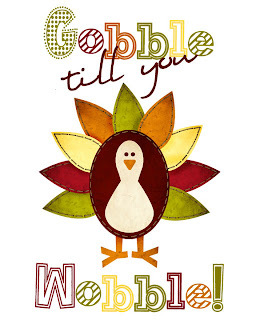 for the 3 ladies who left a comment on the "GOBBLE TIL YOU WOBBLE" free printable post! Email me with your name & address and we will send a fun little goody in the mail to you! Thanks a ton for taking the time to let us know you are reading. Here is a video clip from last year when we were on Studio 5, highlighting some ideas for viewers to do for Thanksgiving place settings: I especially like the color scheme we used: brown & gold with a pop of turquoise and/or orange! Modern, yet sophisticated... Let us know if you use any of the ideas. Enjoy! make the pop can turkey favor, so stay tuned! 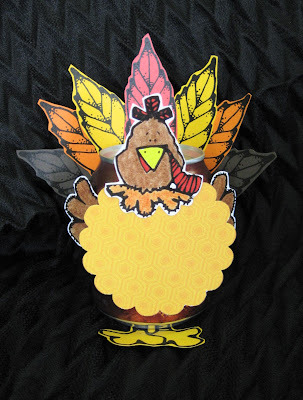 Here's another great FREE Thanksgiving decoration! 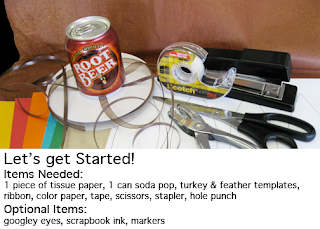 All you need for this simple Give Thanks Banner is some ribbon, a printer, and some paper! I love simple projects like this one... how about you? What a darling idea! A Pilgrim's Hat made out of a cookie, a marshmallow, and some chocolate chips. 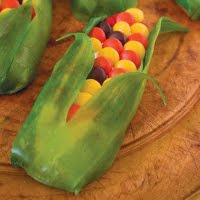 Easy yet your kids will LOVE making these little favors! Watch this video for a quick one minute tutorial. Did you see us on Studio 5 today? Print out this coupon and bring it in today or tomorrow for 20% off one entire purchase! Yey! 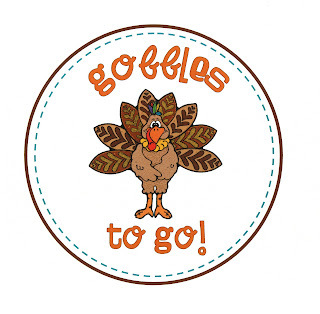 It would be a great time to grab some Thanksgiving favors, Christmas cellophane, and maybe a little something just for YOU! If you missed the segment on TV, check it out HERE. Mark your calendar - This Friday I will be presenting on Studio 5 again - with the topic being "Thanksgiving Favors, Placecards, and Hostess Gifts"
Tune in for ideas and also a "Studio 5 Viewers Special"